Thin content is low-quality content. This is considered as the most annoying matter for smart SEOs and marketers. Google realized that people were pouring the database with low-quality posts with hot keywords, backlinks and duplicate content in search of cheap traffic. It can be possible that your site may even have some thin content, whether you meant it to be that way or not. Not a single website is perfect worldwide and it’s very common for lower-quality posts or pages to be hiding amongst your higher-quality stuff. These thin contents can hurt your website in search rankings. Thin content or shallow page is a web page with no real value besides building traffic. It contains no great insights into the industry, no good information about your product or no useful link. How to Identify Thin Content ? Google always suggests that you should check with your friends and family members for the posts you have in your blogs. Confirm whether the posts are really useful for any of them at all. 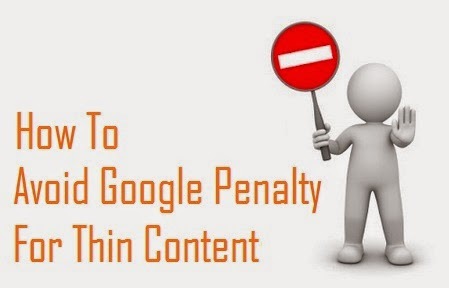 This is the easiest way to identify thin content. Google Analytics: You have to use the exit rate to sort on the “Review All Pages” section, and look at pages with a 75 percent bounce rate or higher. See the content on those pages, which are failing to keep viewers' attention. Screaming Frog: You have to use the URL scrape tool and then sort the exported URLs by word count. If you have a lot of pages with fewer than 250 words, you have a problem. Open Site Explorer: Always check the backlinks on your site and where they’re coming from. Also note the social media statistics to see if your pages are resonating with Facebook, Twitter, LinkedIn and other users. What To Do When Discovered Thin Content? You have to be the editor by your own as this entire process would be lying on your shoulder. However, if you see potential in the page then you can put in the time to improve it. Low valued page or thin copy can be improved with a decent modification and rewrite. If you don't find the way to improve it then you may hire a content writer, which is a costly affair. Decide what keywords you are targeting, and always aim for at least 300 words per page. Emphasize on your product, your services, or what makes you unique. Sometimes we write similar contents or partially same topic in our different post. Better you think of merging your pages so that you have one page with unique content, rather than more with thin content. In case, you have a page with huge number of internal links and you do think that the content on the linked pages are useful and doesn't require rewriting, better to eliminate some of those links. Identify the duplicate content pages in your blog and try to eliminate all of them. This will resolve the issue of pages being exact copies of one another, and it should also help with SEO aspects. Once you followed all the steps mentioned above, make sure you revisit your site’s content on a regular basis to ensure you are not continuing to post thin content to the site in future. Each and every post should have real content value so that readers would be interested in your future posts.